Man on the Roof, originally uploaded by Goggla. 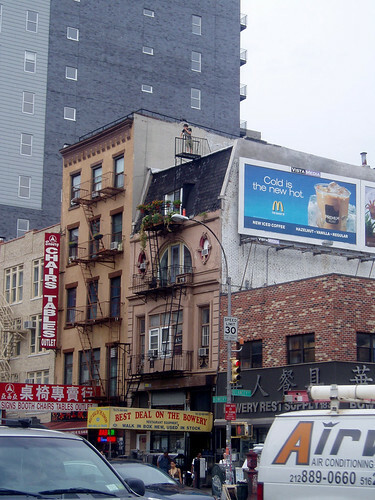 I came across this photo of 185 Bowery in my archives. This was taken in July 2006 on one of those hazy humid days. The man on the roof caught my eye this day, but even without him there, this building has always drawn me. The roofline, arch and oval window give this building personality and make it stand out in a sea of boring, ugly, unimaginative boxes (note the ominous grey monstrosity in the background). Damn, what a pity. It's (was) a charming little building. damn, it's been a while since i've passed by that building. i always dreamt about what it must be like to wake up in a bed next to that top little window. Bowery Boogie has more info on this building here.